"Oh golly, Andy, I just always wanted to write a column about this here March Madness!" "Well Barn, it looks like you done got your chance." "I'm just so excited, I just don't know where to start! This here is basketball country, you know. You got them Dukies over in Durham, those Tar Babies over in Chapel Hill. Plus, Wake Forest, NC State - good teams know no end around these parts." "'Course, most of them teams already done been eliminated, though. Ain't nary a No. 1 seed left. According to my brackets, looks like only Duke and North Carolina's women's teams are still a-playin'." "Oh, then there's obviously something wrong with your brackets, Ange (sniff). Mine has a couple of Carolina teams meeting in the men's Final Four. The ACE is full of good teams from these here parts." "Uh, you mean the ACC, Barn? ACE is the helpful hardware place." "I know what I mean, smart aleck. Don't get personal. You're just full of fun today, aren't you? Why don't you go up to the old people's home and wax the steps?" "Zip it! Zip it! I just wanna head on over to Thelma Lou's, put my feet up, order a pepperelli pizza from Domino's and enjoy the games. But oh no! Mister Big Shot here has to come along and point out where I'm wrong!" "Now don't go gettin' all sore, Barney! Your mother always did say you was the sensitive type." "Don't be bringing my mother into this! That's below the belt. And, if there's anything that upsets me, it's having people say I'm sensitive. It's just when you take things too far and you don't know where to stop. Do you have any idea how hard it is to work with someone who thinks he knows everything?" "Let's finish our brackets, shall we? I've got the University of Florida and Louisiana State University meetin' for the championship. Oughta be a fine game, a fine game!" "Oh brother! Nice way of showing loyalty to your community. 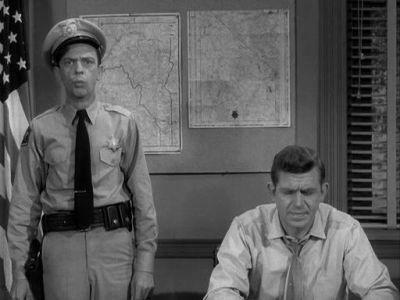 Think the folks of Mayberry will enjoy reading that? Where's your sense of pride?" "It's righ-cheer! It's just that I'm predictin' other teams to come out on top, that's all. Home team can't win every time, you know." "Well, you're not going to be reelected sheriff with that attitude, pal. You just so nave. As for me and my money, I'm putting it all on NC State."